Given prior to and at the conclusion of each course, quantifiable data from pre- and post-tests provides valuable information relative to student growth and academic achievement. See the results. A 1980 ACLU-inspired lawsuit in Hamilton County, TN, drew national attention. Learn more. Bible History classes in our public schools would not be possible without generous support of the broader community. Board member, Mr. Mike Harrell, addresses 23 Hamilton County Schools' Bible History professional during teacher professional development training. Congratulations to over 4,500 middle & high school students who will have completed Bible History elective courses by the end of the 2018-2019 academic school year. 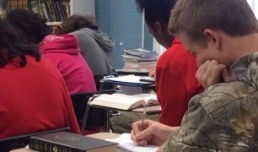 Thanks to the generosity of the Lookout Valley community, approximately 73 students in Lookout Valley Middle High School's part-time Bible History program, will complete a Bible History elective course by the end of May, 2019. Bible History elective courses develop cultural literacy, a component essential to a well-rounded education and the overall development of youth. While wrestling with essential questions around complex text, Bible History elective courses have helped many students process through some of the deeper questions of life. "Every year, there is evidence that Bible History provides a unique benefit to public school students, at no cost to taxpayers, and has a lasting impact in student lives." — Bible in the Schools' Board Chairman, Mr. Chris Maclellan.